Longman English Interactive is a four-level, video based, integrated-skills software program. Students work with contemporary and engaging video, audio, animations, and extensive practice activities to develop essential skills. Longman English Interactive 3 is for intermediate learners and Longman English Interactive 4 is for high intermediate learners. 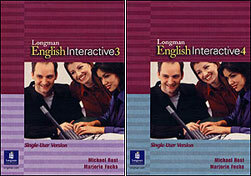 For beginners, please see Longman English Interactive 1 & 2. Speaking, listening, grammar, vocabulary, pronunciation, reading and writing. Longman English Interactive is an interactive program for global communication. The program is available as a CD-ROM for Windows, but is also available as a network version. Longman English Interactive 3 is for intermediate learners and Longman English Interactive 4 is for high intermediate learners. For information about Longman English Interactive for beginners, please go to our Longman English Interactive 1 & 2 page. Longman English Interactive 3 & 4 was designed by Michael Rost and Marjorie Fuchs. Course material is based on an exciting video drama involving an aspiring journalist and a sports star accused of accepting a bribe. Students develop skills in speaking, listening, grammar, vocabulary, pronunciation, reading and writing. Role-plays with video characters engage learners and create realistic dialogue practice. A unique pronunciation feature uses animation to help learners focus on word/sentence stress and intonation patterns. Animated grammar explanations illustrate how grammar works. Culture Notes help learners understand cultural differences and learn new language within a broader social context. Native language support in nine languages for Instructions, the Orientation, Culture Notes, video and audio transcripts, and Help. Each level offers 100 hours of instruction, and is available in both American and British English. To learn more about Longman English Interactive 3 & 4, you can view the Course Syllabus and a sample of the Teacher's Guide as pdf documents. You need to have Acrobat Reader installed on your computer to be able to view the document. If you do not have it, please download a free copy of Adobe Acrobat Reader. Longman English Interactive has a carefully designed core curriculum, with Integrated Skills Development, Learner Support, Assessment, and a "Virtual Tutor". A variety of special support features guide students in their learning. Learn more about the Virtual Tutor. A Communication Companion Student Book is available for each level of the course. The books have been especially designed to provide opportunities for the teacher to incorporate in-class activities into the program. Extensive pair, small group and whole class practice highlight the key teaching points in the online course. If you need a quote for more than 5 users, please contact us and we will be happy to help you out. *Please Note That We Cannot Ship Outside of the USA for this product. *Please Note That We Cannot Ship Outside of the USA for Longman English Interactive.